You are more likely to be attacked by Donald Trump if you say his inauguration crowd was not the largest ever than if you are a homicidal neo-Nazi who drove a car into a crowd. 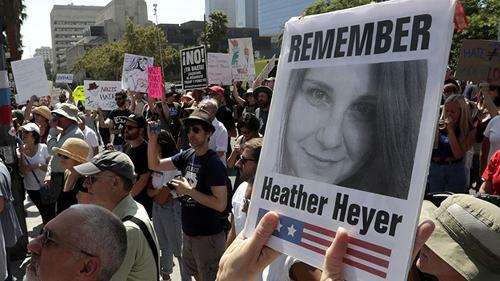 It should have been a no-brainer to come out speak out against white supremacist groups such as neo-Nazis and the KKK after the events in Charlottesville last weekend. He remains unwilling to stand up to his base. After receiving considerable criticism, Trump finally did read a prepared statement which appeared to be more an attempt at damage control than a sign of any sincere convictions on his part. In a long, combative exchange with reporters at Trump Tower in Manhattan, the president repeatedly rejected a torrent of bipartisan criticism for waiting several days before naming the right-wing groups and placing blame on “many sides” for the violence on Saturday that ended with the death of a young woman after a car crashed into a crowd. “Many of those people were there to protest the taking down of the statue of Robert E. Lee,” Mr. Trump said. “This week, it is Robert E. Lee and this week, Stonewall Jackson. Is it George Washington next? You have to ask yourself, where does it stop?” he said, noting that the first American president had owned slaves. Donald Trump has hardly shown any desire to wait for the facts in the past, such as when he would rush to blame Muslims for terrorist attacks. When we are dealing with neo-Nazi and white supremacists groups there are not two sides to blame. There is no equivalency between these white supremacists groups and those who came out to stand up to them. There is also only one side which committed murder in Charlottesville. Trump also showed no hesitancy in attacking the press, retweeting a cartoon of a Trump Train killing a CNN reporter, although he did later delete the tweet. Promoting such violence is as bad a reaction as his refusal to consistently condemn white supremacists. Posted in Donald Trump, News Media. Tags: Donald Trump, Racism. RSS feed for comments on this post.. TrackBack URL.